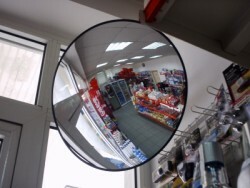 You will see our company's Indoor mirrors in a major European supermarket chains, gas stations, storage areas, assembly lines in factories and other industrial. Our standard mirrors are sold with black decorative rubber along the periphery, and on request it can be white without any additional payment by the customer. 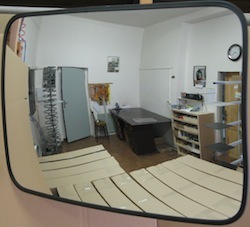 Part of the kit are fasteners with which to mount the mirror to the desired location. 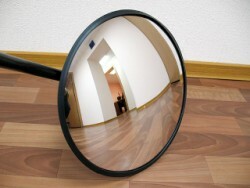 The flexible holder that will target the mirror in the desired direction has a length of 33 cm, standard on all mirrors. 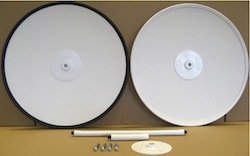 If necessary, we also offer an extension to those holders of 10 cm. 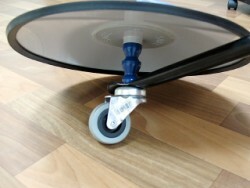 This support is provided to hang the mirror. It's included in the price and sent with the mirror.